We’ve had two more large solar flares already this morning, an X at around 0930 UTC and an M7 starting at about 1230 UTC that is still at M6 levels as I type this (1340 UTC). The results are predictable, large fadeouts on HF, especially the lower frequencies. 31 meters is a graveyard, with very few signals, all weak. I am hearing China on 9845, probably because the path to the west of me is mostly in darkness still. CFRX 6070, which is usually S9+, is about S3, with many deeper fades. 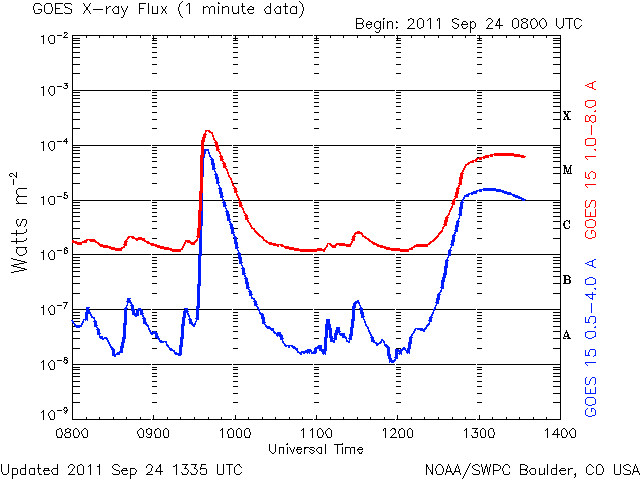 Update: There’s been some more flares today, with an M3.1 just peaking now, at 1730 UTC. If you want to keep up to date with solar events, including flares and geomagnetic storms, you may want to give DX ToolBox a look. It runs on both Windows and Macintosh systems, and provides real time data and graphs. Plus a zillion other radio related features. This entry was posted in Shortwave by Chris Smolinski. Bookmark the permalink.